Some caravanners might argue that the B+ E test should be compulsory for all. But if you passed your driving test on or after 1st January 1997 and you want to tow a caravan or trailer weighing more than 750kg and the combined weight of this and your tow car is more than 3,500kg then you’re going to have to take this test to be legal on the road. 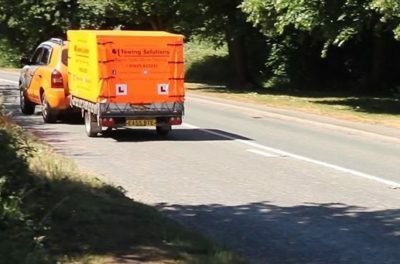 In this video, we go through what’s involved in the B+E test with ex-police offer and Towing Solutions instructor, Frank. How long does the B+E test take? How can I book the B+E test? It can be booked via the gov.uk website or via a towing course training provider, who will do all the paperwork for you and book the test. How much will a B+E test cost? 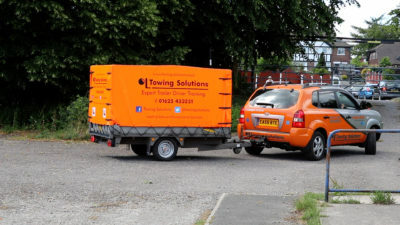 The test costs £115 but it’s also worth booking on a towing course first to get some towing instruction and experience and find out more about what’s involved. Do I need to take the B+E test? If you took your car driving test after 1st January 1997 and hold a group B licence and want to tow a combined weight (car and caravan) of 3500 kg or more then you will need to take the B+E test. 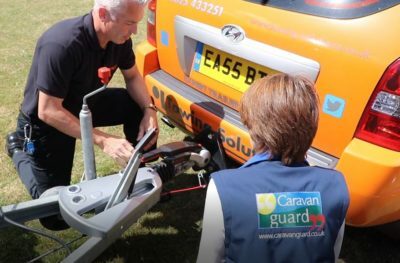 After 1997 restrictions came into place in terms of the size and weight of caravan you can legally tow. What does a B+E test involve? Do you tow a trailer or your caravan during the test? A trailer. You’ll need a trailer which you can’t see over or through which has been loaded to 600kg and ticketed to say that’s how much it weighs. Do I get any caravan insurance discounts for taking the B+E test? Yes! 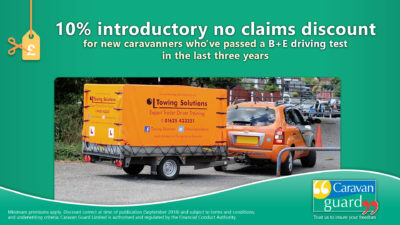 If you’re new to caravanning but have had any experience of towing in the last three years, which includes passing your B+E test, you’ll be eligible for our 10% introductory no claims discount off your caravan insurance premium. You can find more information about the B+E test here. Have you taken the B+E test or a towing course? We’d love to hear about your experiences. Simply share in the comments box below. DVLA took my motorcycle licence off my licence and wouldn’t accept evidence from friends or family, or the fact that I had a700cc motorcycle. I had to swear an affidavit with a solicitor before my licence was reinstated with the motorcycle class added. This is a genuine warning. CHECK YOUR LICENCE. The DVLA makes a habit of missing groups off renewed licences. Take a photocopy of your licence before sending it off. Then when the DVLA tells you there is no record of you ever passing a test, you have proof. On the bright side, you may find that they have added the odd group. In my case, the Heavy Motorcar group, now C, has gone and my licence has had to be returned for correction, together with a photocopy of my 1974 paper licence.